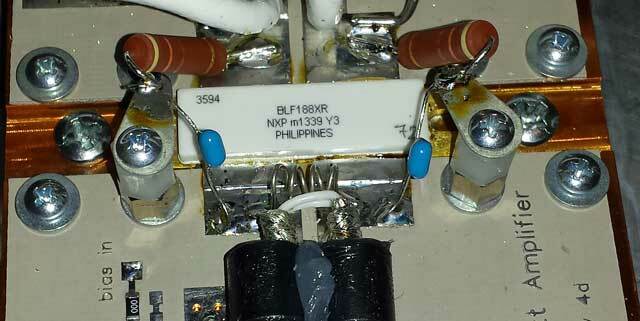 Locate the eight 470pf MC18 mica capacitors, they will be installed on the output board first. Install them in groups of four, mounted on their thin side as shown. Mounting them in this way helps to even out the RF currents in each one. Then mount the rest of the capacitors; the 1000pf, .01 and .1uf chip bypass caps are aligned near the transistor pads spanning the the VDD and ground traces, and the 100uf electrolytics are around the corner to the right of them. Note the polarity markings on the electrolytics. 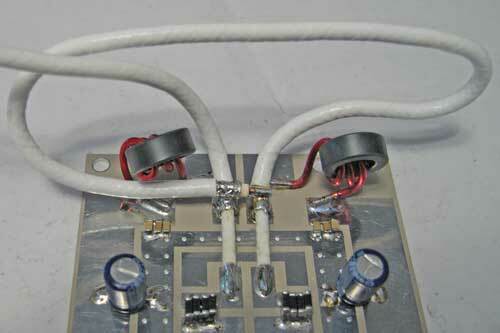 Next, mount the two TC12 coax transformers, beginning with the longer trimmed ends. There are 4 points to solder...the tips go to the MC18 blocking capacitor traces, and the shields to the transistor traces. Ignore the VDD drain chokes in these next two photos, they have been replaced with a bifilar transformer (shown later). Loop the first coax around and rest it on top of the other exposed coax shield connections as shown. Note the center conductor of the looped-around coax rests on top of that coax's own shield, and the shield on top of the opposite coax's shield. Solder into place. Since we had so much fun with that first piece of coax, let's go ahead and loop the other one around and solder it into place as well. Install the bifilar VDD DC power feed transformer as shown. The short wires go to the drain pads, and the longer ones to the bypassed vdd 50v pads. Your completed output board should now look like this. Now install all the components onto the input board except for the 4 to 1 ferrite input transformer and 4-turn gate inductor. Pre-adjust the IDQ trimmer resistor almost all the way clockwise, about a quarter of a turn. Be careful, this trimmer is fragile. 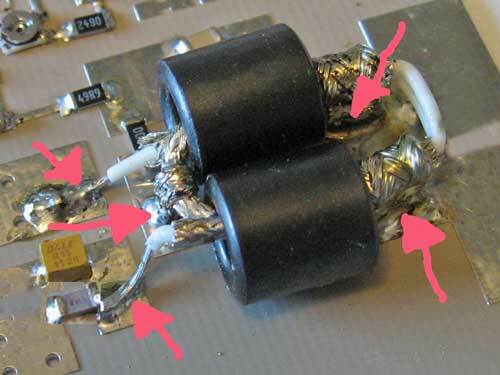 Install the input transformer, soldering it to the board at the five points indicated. Slide the boards under the transistor tabs (transistor should have been previously flow-soldered to a copper spreader). Here is a video showing how to flow-solder your LDMOS to the spreader. 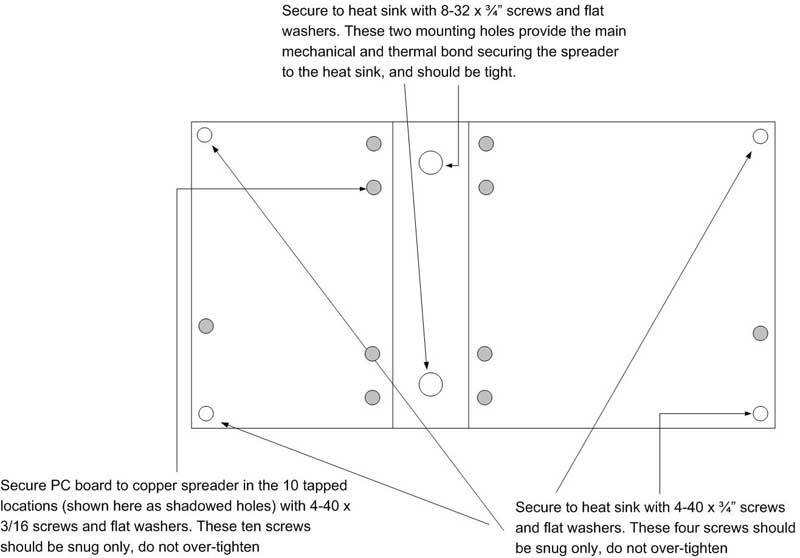 Here is the drilling template for the spreader. Secure the boards to the spreader with 4-40 x 3/16 screws and flat washers. Do not over-tighten. 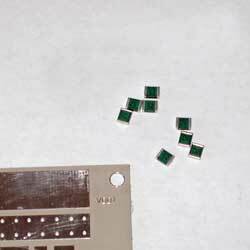 Use some liquid flux, and solder the boards to the LDMOS tabs as shown. 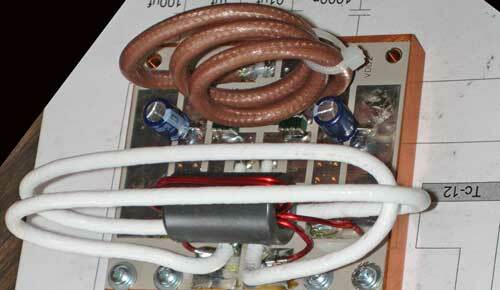 These final instructions refer to the degenerative feedback components included in your kit; two 440 ohm 3w metal film resistors and two .047uf 450v capacitors to be installed drain-to-gate (resistor/cap in series) on each device half, as shown in the photo. The addition of these components is recommended, as they ensure unconditional stability by applying degenerative feedback. This feedback is most effective at very low frequencies where these LDMOS devices have excessive gain. Without the degenerative feedback, and under certain rare conditions, self-oscillation can occur and destroy the LDMOS. 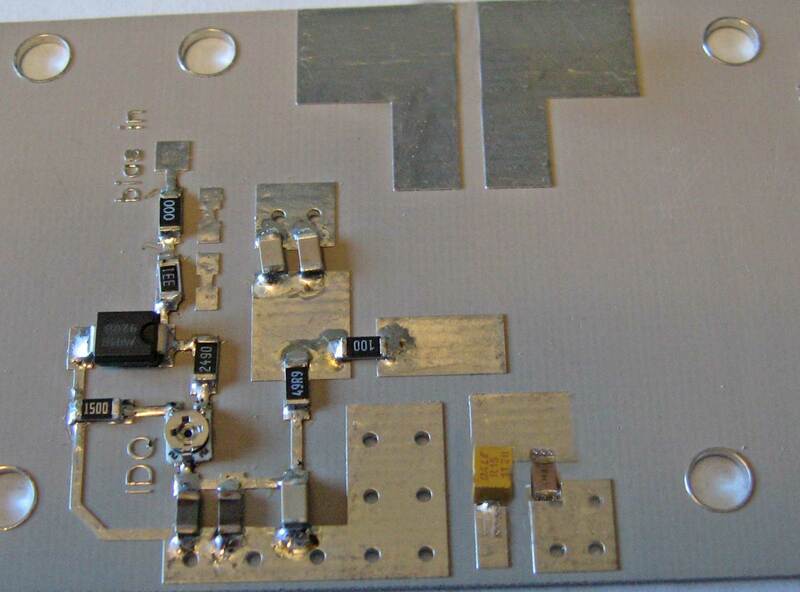 These components are best added after kit assembly is complete, but before testing the amplifier. 2.Replace the screws with the ¼” hex metal spacers. 3.Screw the ¼” nylon spacer into the metal spacer. 4.Place a solder lug on top, and fasten in place using the 4-40 x 3/16 screws removed earlier. 5.Solder the resistor to the drain pad and route the other end to the solder lug. 6.Solder the capacitor to the gate pad and route the other end to the solder lug. 7.Solder the resistor / capacitor connection at the solder lug. 8.Repeat for the other side of the LDMOS device. Fasten the spreader to a suitable heat sink using the guide on the right. Use a thin but even coating of heat sink compound between spreader and heat sink. Attach input and output coax jumpers. Your driver should be limited to 2w max, and the output should be on a dummy load for the initial testing. CAUTION - for the initial test, you should place a 3 to 5 ohm 50w power resistor in series with the VDD, or use a current-limited power supply (limited to 5a). 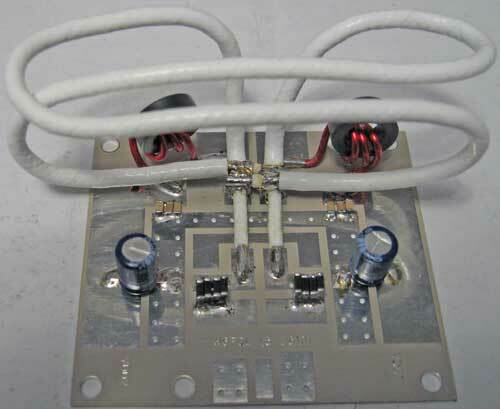 If there is a short from a stray wire strand, or a weak capacitor lets go, it will create an arc powerful enough to vaporize board traces, transistor tabs, etc. Drive the amp with about 1/2w, and check the output; it should be in excess of 250w. If all is OK, the amplifier can now be driven to full output. Typical performance is 1.5 w in, 1kw out at 50V VDD and 29 to 32 amps. 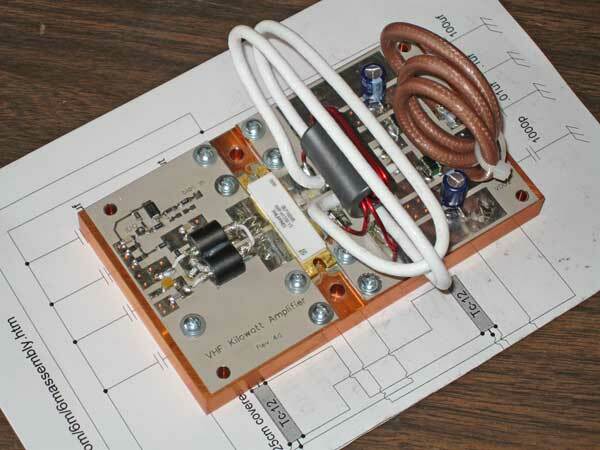 Many of these RF decks will produce 1200w with 2 to 2.5w drive (50v VDD, 33 to 36 amps). Please note: if you are using a reflective low-pass filter following the output of this amplifier, be aware that third harmonic levels are high, and some danger to the LDMOS exists if this energy is not reflected back in the correct phase. 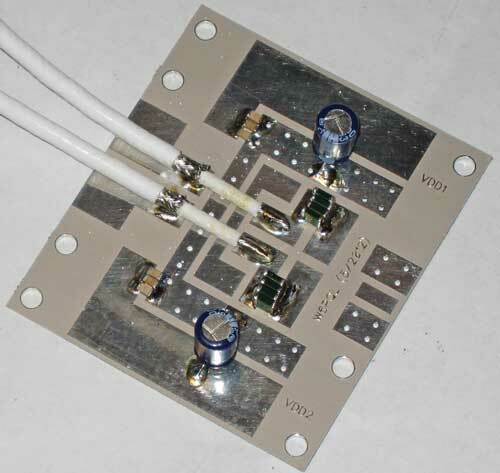 For this reason, a length of RG142 (or other suitable coax type) is recommended between the output of the RF deck and the input to the filter. Some experimentation with the length may be necessary, but a general rule of thumb is to use a length that will produce at least 60% efficiency. 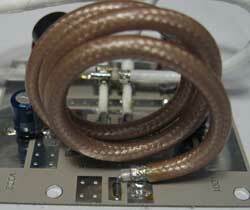 On most installations, and using the filter I offer on the parts page, this would be about 30cm (1 ft). 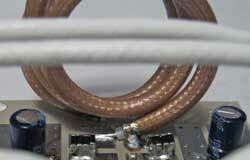 If the length of this stand-off coax is incorrect, you will know...the efficiency will be low (less than 60%).